Process Indication Panel offeredprovides vital support as process value indicator in different industrial control applications. Allowing configuration and calibration using front panel keypad, these panels also feature easy to handle and understand serial interface facility. 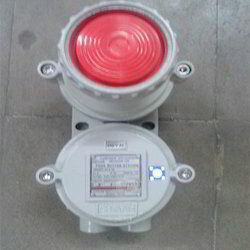 Featuring presence of compact FLP housing and isolated channels with transmitter power supply, these flameproof and weatherproof centralized indication panels also allows selectable input choices. For best performance, all channels come fully isolated with transmitter power supply. 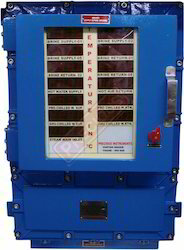 Flameproof Temperature Indicator offered comprise quality finished and industry approved range of flameproof and weather indicators that feature enclosures coming with push button, rotary switches and glass window for better usage support. Coming in aluminum construction, these enclosures also meet defined compliance standards as per gas groups 1 & 2 Gas group IIA/IIB CMRI and provide for high-speed A/D conversion. Further, these indicators also come with dual display, dual input choices with display support in form of 0.15" red LED and cable entry in form of 3/4" ET -04 No. Usage Automobile industry, Petrochemical industry, Chemical industry, Pharmaceutical industry, etc. Flameproof Starter Panel offeredcomprise high performance and latest technology based flameproof starter panels that find use in varied industry sectors like the Automobile industry, Petrochemical industry, Chemical industry, Pharmaceutical industry among others. Featuring superior engineered finish, these panels come in precise construction standards that provide for optimum usage and longer functional support. These panels are also resistant towards the fire, low/high temperatures, and corrosion possibilities and can also be custom modified as per the specific requirements of the customers. 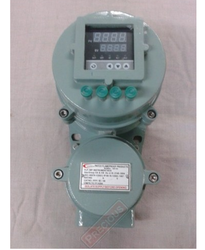 Leveraging on the support of dexterous professionals, we are able to come up with a comprehensive array of Flameproof Digital Controller. 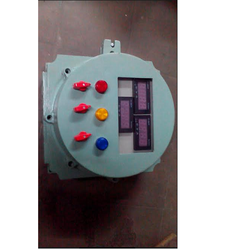 With our vast experience and knowledge, We are engaged in manufacturing and supply of the large scale of Flameproof Digital Controller /Scanner. 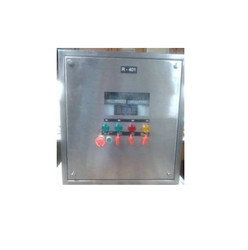 These Flameproof Digital Controller /Scanners are available in standard sizes but, can be modified into any sizes by our skilled Engineer. We are the leading name in the industry engaged in offering our valued client Flameproof Hooter facilitate our esteemed customers by installing these flameproof hooters in securing their houses, hotels, schools and other similar places. 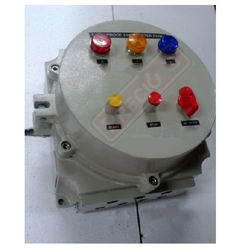 These hooters are widely used in commercial and non- commercials sectors. Reactor PanelWith the expertize gained over the years, we introduced Reactor Panel free from fire hazards. These panels are built with superior-grade raw materials these panels are specifically built for various reactors. These are built under the purview of extremely talented team of designers and highly qualified team of professional. These professional leave no stone unturned to meet the high standards of international norms. Our rector panels indicates temperatures, has a vent and vacuum selector switch, a view lamp switch and a indicator lamp as well to facilitate the client. Looking for Flameproof Instruments - Panels & Junction Box ?